What should I do if I am from out of state and I have a personal injury claim in Washington State? Injured While Visiting Washington State? You may be at a legal disadvantage if you were injured in Washington State, but live somewhere else. The insurance company knows this. 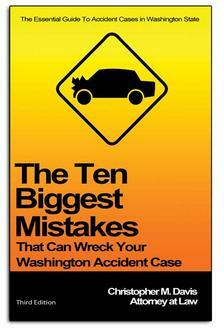 In Washington you generally have three (3) years to settle a claim or file a lawsuit. This is called the statute of limitations. This limitation period begins to run the date of the accident that caused your injuries. If you are seriously injured, or have missed significant time from work, or if your medical bills are high, you usually should consult with a lawyer right away. Resolving injury claims can be difficult because you are usually dealing with a large insurance company with enormous resources. The company will usually be gathering information to either defeat your claim entirely or minimize the damages it has to pay out. If you can’t settle the claim, a lawsuit must be filed in Washington State. You must retain a lawyer who is licensed in Washington. A lawyer licensed in Washington State will have the most leverage when it comes to settling your claim with the insurance adjuster. Be sure to notify your own insurance company, as you may qualify for benefits through them. Why do I need an attorney licensed in Washington State? Or in my home state? Each state has its own personal injury laws. You need an attorney that has extensive knowledge and experience of Washington State personal injury law. An out-of-state attorney may be able to assist you by answering general questions about the claims process, but because each state has its own laws, it is vital to hire someone who can be our best advocate by knowing the intricate details of Washington State’s personal injury laws. Furthermore, it is important to hire an attorney that is located in Washington State because they will be familiar with the location that your accident or injury occurred. An attorney that is familiar with the specific county, city, and location of your accident can immediately contact local personal to help preserve or discover more evidence in your case.